Pseudopanax are native to New Zealand and Tasmania. Very interesting foliage, some large trees with serrated sword like leaves that droop at an angle from the trunk, and a hardy tree and well worth a place in the garden. Others are smaller shrubs with attractive foliage. Used for the interesting foliage as an architectural feature in landscaping schemes, the variety of foliage and growth habit opens up a number of possibilities. Pseudopanax lessonii ‘Gold Splash'(pictured right) has attractive variegated foliage and grows to be a bushy shrub, easily pruned to maintain shape. Pseudopanax lessonii ‘Purpureus’ has a similar habit but with purple foliage. P. crassifolius is similar but with a more open habit. 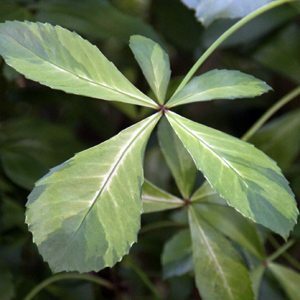 Pseudopanax are used in landscaping, P.crassifolius with its architectural leaf form and good structure make a good specimen tree. P. lessonii (cyril watson, gold flash and purpureus) are smaller growing and work well in large pots.